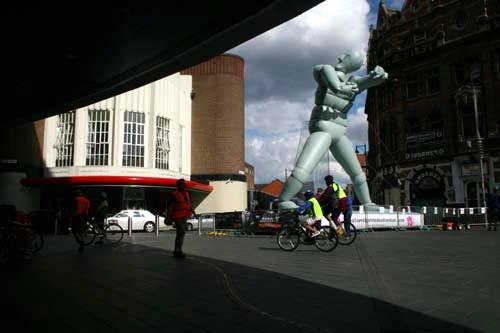 A core part of Simon McKeown's 'Motion Disabled Unlimited' commission is an 11-metre-tall inflatable sculpture of a disabled avatar with short arms, which has been touring the country. Deborah Caulfield wrote a response for DAO, analysing its impact as part of the torch relay celebrations, in South Park, Oxford last month. Throughout the duration of Unlimited, from 1st-9th of September - the video components of the project are being shown on the Level 2 Foyer inside the Royal Festival Hall. Taking the motion of the modern day disabled athlete, the Paralympian, McKeown uses Hollywood technology to create 3D avatars that invite you to find the beauty, the exotic and the normal within their movements and physical form. Mckeown explores the borders between normality and difference and celebrates the movement of disabled people in a way that is as compelling as much as it demands that the audience question ideas of impairment as loss. I remember when I saw the first pieces of motion-capture work in the series in 2009 it struck me as a piece of 'Dance for Film' exploring the uniqueness of movement and physicality associated with particular impairments. In the last few years with advances in digital technology this medium has been used more and more in live performance. For example Klaus Obermaier's 'Apparition' which was shown at the Brighton Festival earlier this year turned the moving forms of live dancers into kinetic shapes and forms. Think Bridget Riley stripes moving as they describe a physical form and you'll see what I mean. As clever as this kind of work is, in turning the movement of the human body into something visually stunning, it is facile. I love the way it uses technology to create something new, but it strikes me as cold and lacking in emotional response. McKeown's work, like the best of Disability Arts, has something real to say about the value of a world inhabited by a wider range of types of human being. As Pauline Heath, one of the actors in the first Motion Disabled film capture series, said: "If you think about a world without disabled people, it would be a bit bland - a bit like IKEA." Motion Disabled Unlimited can also be seen at the West Cheshire College, Ellesmere Port, Cheshire from 5th - 8th of September and Market Square, Loughborough City Centre on the 9th September.